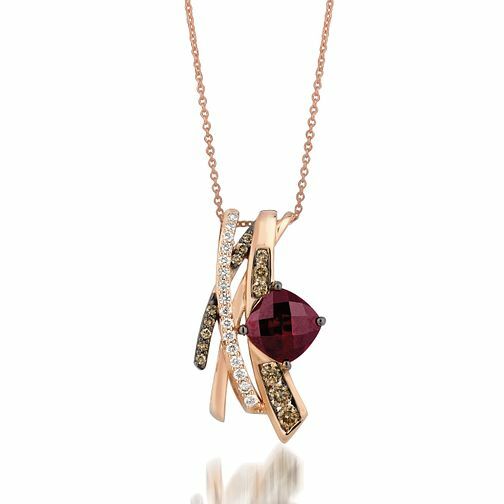 This perfect pendant is placed upon a 14ct rose gold chain, with captivating diamonds and a rhodalite garnet gemstone adding a pop of colour around the neck. This sensational piece of jewellery is sure to steal the heart of the wearer, with a unique and quirky design presented as a sophisticated package. Beautiful set stones, this pendant is perfect as a present to a loved one, or as a treat to yourself. Le Vian 14ct Rose Gold Rhodalite Garnet & Diamond Pendant is rated 5.0 out of 5 by 1. Rated 5 out of 5 by Anonymous from Stunning Stunning necklace. My husband bought it for me for Xmas as I love Le Vian jewellery. It is gorgeous & I have had lots of compliments when wearing it.